lots of us are sending messages to him, and getting messages back. I thought maybe we could post them all here to look them over for clues as to what's going on and who he is. Please post both what you sent to him and his response to you. Subject: We learn more by looking for the answer to a question and not finding it than we do from learning the answer itself. I realize that this message may come off as somewhat of a surprise, and is completely random, and I apologize for this. Though, I happened to stumble upon your profile searching for an old friend. I got curious and decoded your message. I am not sure who the intended recipient of that message is, and I hope that I am not in the wrong for coming up with an answer. But there are many questions pressing me right now and I hope you don't mind answering them to ease my mind. 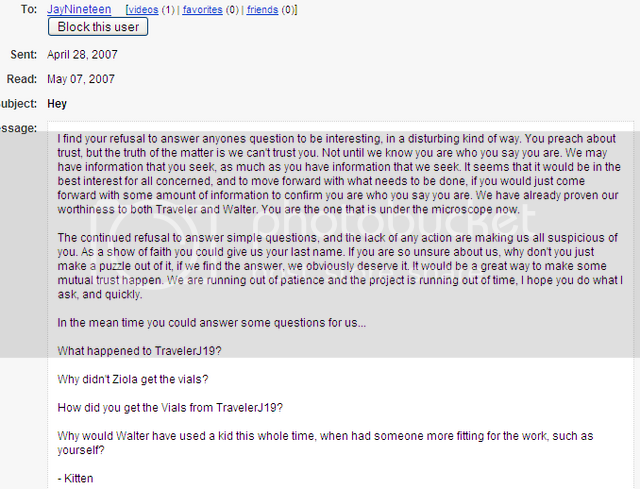 Are you perhaps an acquaintance of TravelerJ19 or WalterDW? I was conversing with them about a few issues, but seem to have lost contact. If you do by chance know them or of their whereabouts, I would greatly appreciate it if you could share that information with me. I fear that they may be in danger; and that a few secrets may be at stake. I trust that you will you be honest with me. Subject: Re: We learn more by looking for the answer to a question and not finding it than we do from learning the answer itself. Since you are of the mind that you learn more by looking and not finding, then perhaps, for your edification, it is best I not spoon feed the answers to you. My advice is instead you continue seeking. Subject: No question is so difficult to answer as that to which the answer is obvious. It is apparent that my message was not straightforward enough. The point wasn't that I wanted to be spoonfed answers,but instead wanted clarification. Many of us fear for the worst on what has become of Walter and TravelerJ, and even more so of the vials that were to be en route to a declared recipient. I have spent literally weeks, seeking out answers with nothing but open ends, and unanswered questions. I would hope that you would have the decency to answer a few simple questions. Subject: Re: No question is so difficult to answer as that to which the answer is obvious. Send me a few simple questions, and I will provide you a few simple answers. Hi Jay, how's everything? I see that you've subscribed to WarPylol. Quick-tempered, you say? Indeed, seems like "location verified" has gone against him a couple of times now. So, I thought I'd tell you a little bit about myself: I always tell lies, can't really avoid it, ever! A knave, if you will. 1. If I were to ask you "is it a bad idea to destroy the cure?" you would deny it. 2. You're just like me (see above) XOR your answer to this statement will be a lie. Please think them through and answer carefully, that is, if you do agree to answer. I'm not sure if I expect an answer or not, but I thought, what's the harm in trying? Walter told me of you – a quick study, and a useful member of the team. In your roundabout way, you have identified a primary element essential to the success of the project. Trust. So true. So, why should I trust you? > ...a primary element essential to the success of the project. Trust. It is of greator importance that I should be able to trust you. > So true. So, why should I trust you? Well, that spelling ain't really helping. > It is of greator importance that I should be able to trust you. Ha Ha, fair enough, but remember this is not a game. We have a serious project to complete. Spelling is the least of our concerns. > Well, that spelling ain't really helping. Alright, I agree. So what's your last name? I am being watched. Timing is of the utmost importance. The information you seek will be forthcoming at the appropriate time on a need-to-know basis. Trust. That is all for now. > Alright, I agree. So what's your last name? The volunteer corps has been going crazy over your profile. Going crazy, I say crazeeeee! All attempts at decryption have gone nowhere. Lame "TGAC?" meaning give us a hint whether it's an encrypted DNA sequence we're looking for. I sent this to him awhile ago, and have not go a response. Maybe this puzzle is the response, so I thought I would post it just in case. I'll add the response here should I ever get one lol. I'm too lazy to do screen caps. I have recovered the package that was left at UC Santa Cruz. It seems that the package was intact and no contents were damaged. My colleagues have discovered what appears to be a friend or partner of yours, Sandi. She is resistant to speak with us. What information can you give me about her? By the way, you spelled vial wrong on your message. Or perhaps that was Sandi? Or was it intentional? I know you want vials destroyed, but I don't know what to do with a vail. I've given you everything required to do what you need to do. When you have finished your task, we'll talk. You can find me on MySpace, MyTube, MyIRC and now MyBebo! Well done. You've passed this portion of the test. Vial or vail? You'd think that after 75 years one would learn the correct spelling of this simple word. While it's true, I have been known to make mistakes in my time - very large ones in fact - vail is not one of them. If ever you catch a mistake on my part, I appreciate you calling my attention to it. But why have you pointed us to this Star? About Sandi - you need to understand, she's not like the rest of us. Why have I pointed you to her? Stars help us navigate through our darkest hour. We're going to need her. You don't make spelling mistakes from what I've learned. I see that the 'o' is not the same size as the rest, and 'o' is not an amino acid abbreviation. Is there a key we're missing? Just thinking out loud... to you. This may be a stretch for those of you who are more firmly based in logic, but to understand the remainder of the embedded information, it's time to journey into the realms of archetype and allegory. P.S. As deagol will attest, I most certainly do make spelling mistakes. If you are ever uncertain, simply ask. ETA: If you guys want screen caps, just ask. Until then, I'll continue being lazy. I dropped a line to Jay on the 28th, just after his most recent login. Since he seemed to be using youtube as his primary channel, I sent him a copy there last night. I sent a message to your other point of contact a few days ago, shortly after the last time you logged in there. Patience is a virtue I'm proud to espouse, but in the interest of expedience, I thought I would relay my correspondence here as well. There is another note waiting for you there, but it is not as pressing, and probably doesn't tell you anything you don't already know. I was recently contacted by the people working with you on carrying out Walter's program. I imagine they singled me out based on my scientific background. Given the sensitive nature of this undertaking, I wanted to communicate with you directly to ensure that my involvement does not jeopardize the mission. to view a brief CV. I'm sure you're familiar with the institute that employs me. In fact, you probably have had a number of collaborators there, and I'm sure many technical staff from The Facility ended up there at one point or another. If you remain skeptical about my trustworthiness, contact me based on the information you see on that page. You know that just not anyone can get an email address under that domain name. Welcome to the team Dr. Mylastname. You may call me Jay. My apologies for not responding to you sooner. The demands of this project are sometimes more than I can juggle, and currently, I don't have a trusted assistant. I'm getting on in years you know, and I don't move quite as fast as I used to. While time is of the essence in completing our work, thoroughness is more important than velocity. It has been some time since I have had any personal involvement at your campus, however I did some consulting for Professor Emeritus D_____ when he was based there in the early days of his meteorite research. I appreciate that you recognize the sensitivity of this endeavor. Your involvement in no way jeopardizes the mission. I expect you will be a tremendous asset. Your credentials certainly speak for themselves. I am looking forward to our future association. There's nothing really new here (at least, not that I can see), but I figured it was worth sharing for flavor, if nothing else.